Are you looking for the best car window covers to block those nasty UV-ray and sunlight? You came to the right place! We’ll be looking at some of the best window covers to get the job done. When it comes to auto accessories, you should also invest in protection for your interior. Car window covers are a great way to shield the inside of your vehicle. With a sun cover for your car, you can easily defend your interior from heat and the harmful effects of the sun’s UV rays. There are many types of car covers. Some are designed to protect the exterior like snow and frost during the winter season. Whether you buy a car sun shade or a snow-free windshield cover, it’s easy to see that the simple help that car window covers offer are beneficial and effective. Also, if you want to know more different car covers for both the exterior and interior of your cars, head on over to these articles – Best Car Covers, Custom Car Covers and Car Dashboard Covers. Car window shades are great for days when you just want to feel less of the heat while on the drive. In fact, side window shades are fantastic for keeping your passengers (especially babies and children) extra comfy inside the car. 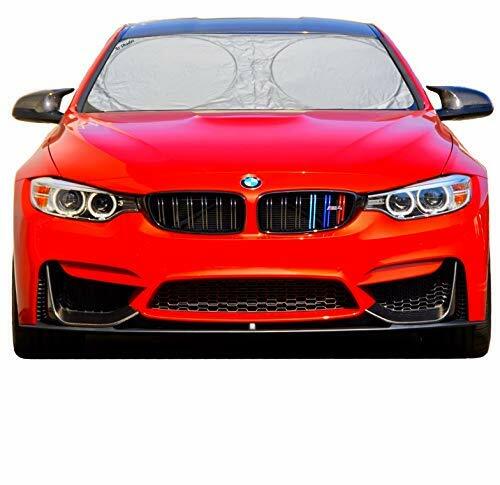 Aside from preventing heat damage, the best car sun shade will also lessen the chances of you getting blinded by the sun’s glare as you drive. Sun shades aren’t just for you. Car window shades for baby are also popular as well. 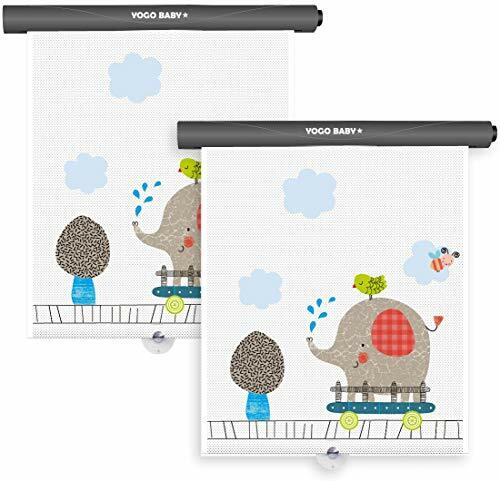 With this set from Yogo Baby, you already get two durable roller car shades for the price of one. That’s value for money! You won’t even need to worry about installation since it easily attaches to your car window with suction cups. Use is also a piece of cake since you only need to push a button for the shade to retract. Yes, that’s right! 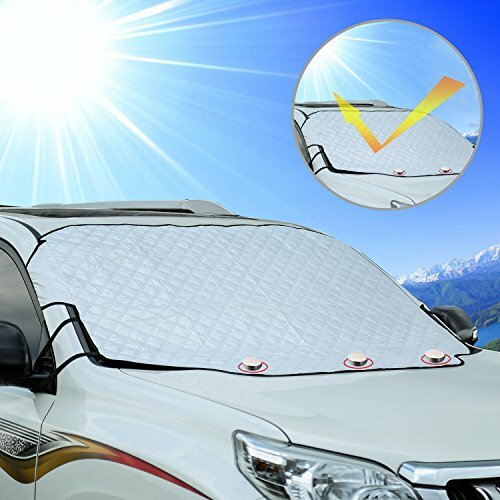 It also acts as a retractable sun shade for your car. 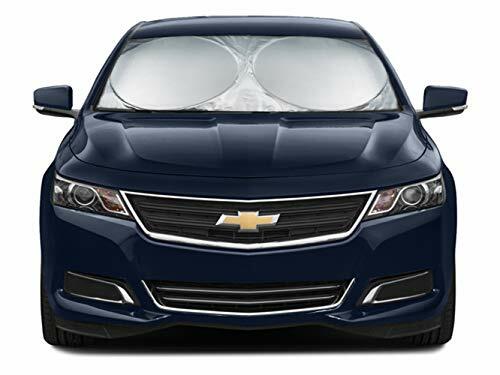 All the while, this sun shade keeps your baby and all passengers protected from the sun. Plus, it keeps your car temperature cooler. This shade features a black roller made from top quality PVC that is flexible, long-lasting, durable, and sleek. This car window sun shade from Enovoe is an example of a classic sun shade. It’s made of a lightweight mesh fabric that can block up to 97% of the harm done by UV rays. That way, you and your passengers are less at risk of skin irritation and the sun’s glare. This sunshade can also keep the inside of your vehicle a whole lot cooler. Another material is used to create the static cling back that it has. This makes application and removal quick and effortless without using an adhesive. If you need a full coverage window shade, then you may want to consider the ShadeSox Side Window Shade. This window shade is excellent at blocking the sun and cutting down the heat and keeps the temperature in your car down. It also provides UV protection and reduced the suns glare. The ShadeSox sun shade is easy to install. It’s flexible and the stretchy mesh made it easy to fit into your car side window. It can fit cars up to 44.3-inch by 20-inch. Visibility is a non-issue as you can still see through the mesh. Also, with the sunshade installed, you can still roll down the window. However, this car shade may not fit perfectly for all cars. It’s best suitable for most sedan cars. Some SUV owner did complaint that the sunshade is too small. 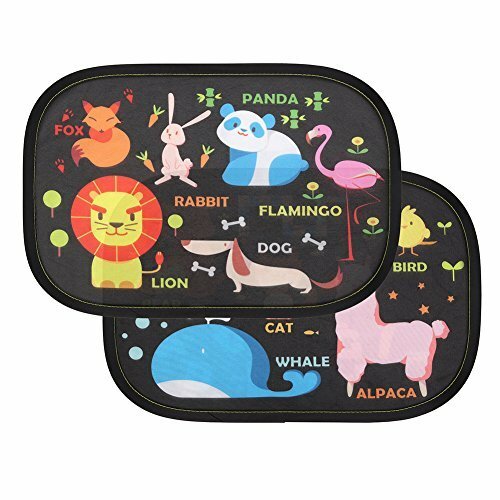 This cute animal print car window cover is an excellent product if you want to give your baby something to look at while in the car. The mesh has colorful designs in bright colors that encourage your child to look at them and the world outside. Also, this window shade has a mesh material that keeps harmful UV and sunlight out but still provides the driver with clear visibility. Installation is straightforward. It’s made to statically cling to your car window. Just open up and stick to the window and it’s done. The sunshade will fit most windows at 18.5 inches by 12.6 inches. 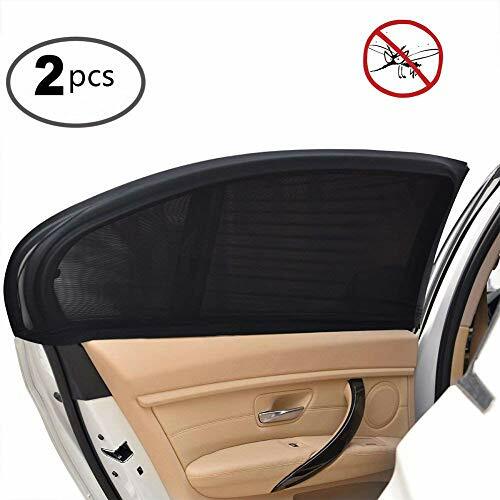 This includes two foldable window sunshades. 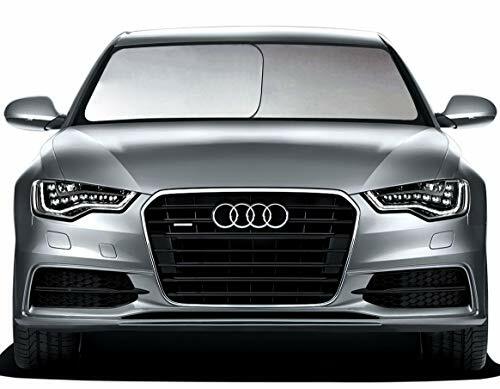 The Uarter Universal Car Side Window is another full coverage window shade that works excellently for most sedan cars. This window shade helps keep the sun glare, sunlight and UV out from the car. It will also help to reduce the heat in the car as well. The shade is a flexible and the stretchy mesh made it easy to install too. And, the mesh design allows the driver to maintain visibility while driving too. Also, this sunshade comes in two sizes The Medium size that fits up to 38-inch and Large that fit up to 42-inch. Another benefit of using this car window cover is that the window can still roll down even with the sunshade installed. If you are looking for an easy to use sunshade, you may want to consider the Kinder Fluff Car Sun Shade. 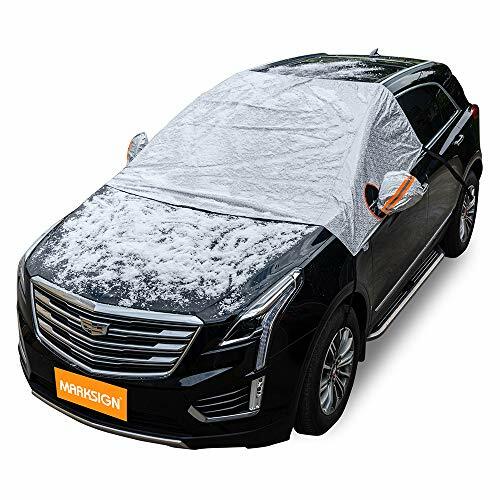 Made of quality fabric, this protective car window cover paired with 80 GSM (grams per square meter) mesh that can effectively block out the sun. Also, this sun shade is easy to install and take off with static cling technology. The measurement of this shade is large at 20-inch by 12-inch. The mesh reduces the incoming sun glare, keep the temperature low and protects your passenger from up to 98% of harmful UV rays. 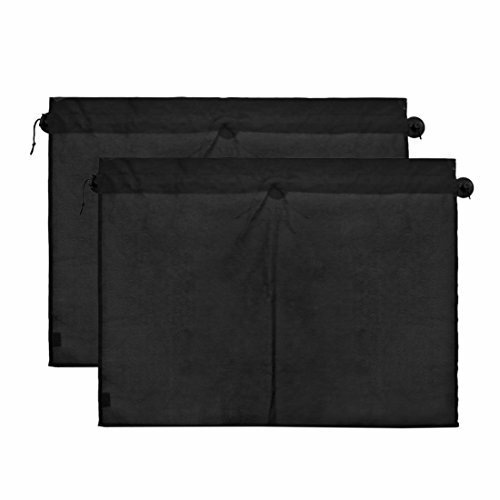 Also, these shades can be quickly folded and stored in the included pouch when not in use. It’s also lightweight and the reinforced frame makes installing and repositioning easy. As for the mesh design, it helps maintain the driver’s visibility too. Also, among all the sunshade we review, the Kinder Fluff car sunshade is the best car window covers. It also had many satisfied customers as well as a lot of good ratings. The sun glare is one of the leading causes of eye damage, especially for children. Children can’t filter UV light as effectively as adults so they are particularly vulnerable to the sun’s glare. 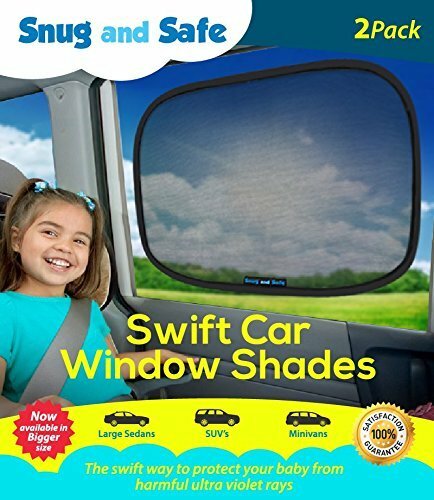 The Snug and Safe Swift Car Window Shade designed to fit most carsSUVss vans jeeps trucks minivans and sedan. It’ also ultraviolet ray tested and certified to make sure it’s effective at cutting down the UV from the sun. Also, this sunshade is made of lightweight material. The dual layer mesh design allows passengers to enjoy the view while still provides protection from the sun’s rays. This sunshade comes with a pouch for storing the shade when not in use and it’s backed by 100% Moneyback Guarantee policy. Another excellent car window shade you might want to consider is this sunshade cover by Cozy Greens. 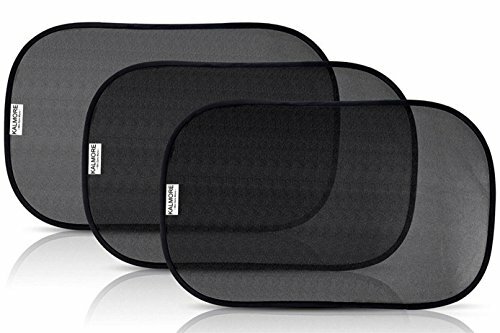 Made with premium material, this car window cover can potentially block over 98% of harmful UV rays and keeps your child and passengers safe from the sun’s glare and heat. The double layer of mesh fabric has been tested and certified UPF 50+, which allows our shades to offer maximum protection and exceed industry standards. Furthermore, this sun shades for side windows are made from a heavy duty reinforced frame making them durable for years to come. The measurements for this sunshade is 21-inch wide x 14-inch height. 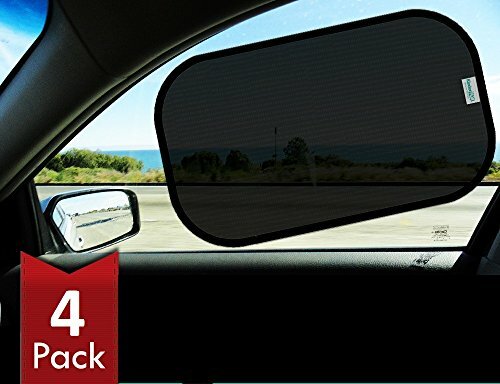 The lightweight mesh fabric made of static cling technology which allows it to easily adhere to your vehicle’s window without the need for suction cups. Also, this product comes with a lifetime guarantee and a free gift; free seat belt cutter and eBook. It’s also good to know that the seller donates a portion of proceeds from each purchase to Child’s Life Chances for Children Charity. 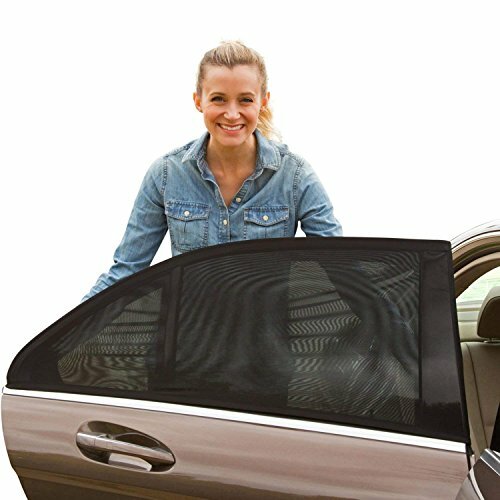 The Kalmore car window shade is one of the best car window covers that fit most cars and small SUVs. It’s made with 80 GSM (highest possible) protective mesh to block over 98% of harmful and strong UV rays and sun glare from entering your car. 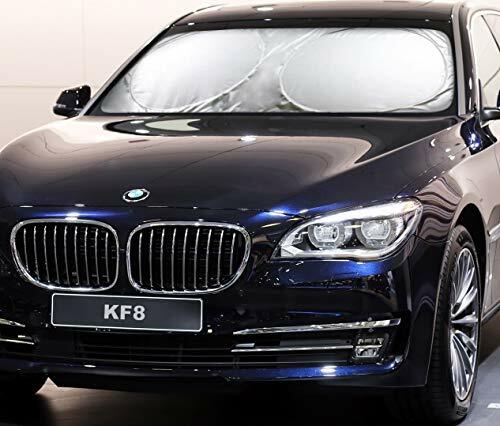 With the special UV resistant technology, this cover provides temperature-isolation to keep your car cool. Any passengers sitting beside this window shade will be protected from sun damage, UV and heat. 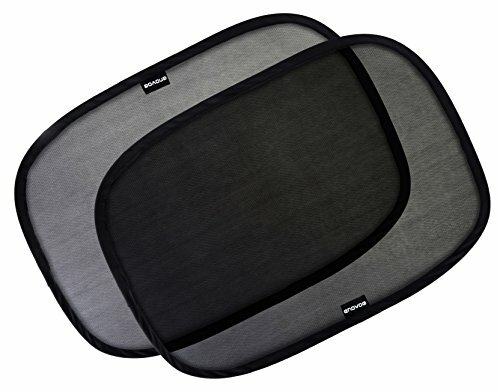 Also, the lightweight special static mesh fabric supported by Super Static Cling Technology that keeps sunshades firmly adhere to the side windows without bulky suction cups. This sunshade cover provides SPF 30+ Protection and the measurement is 19-inch x 12-inch. And, each Kalmore car window cover comes with Lifetime Money Back Guarantee. So now you can buy with high confidence! If you are looking for a car window cover for your baby, the Zacar Cling car window shade is a good choice. There is no need for suction cups or adhesives to install this sunshade. Just open up and stick to the window. The Static Cling Technology will work its magic. Also, the sunshade frame is made of reinforced memory steel wire, making it durable and easy to use and storage into the free compact travel bags that come along when purchase. 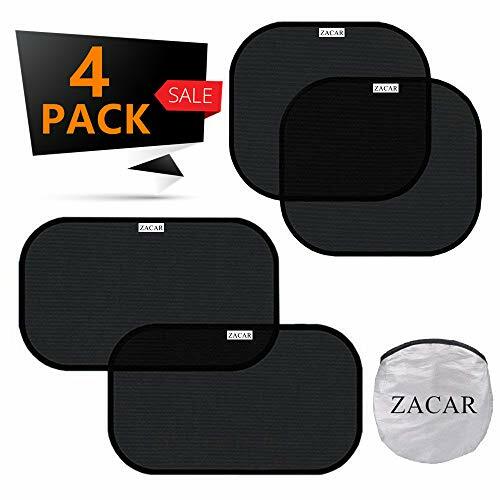 The Zacar car window shade comes in two sizes; 20-inch x 12-inch and 17-inch x 14-inch. These two sizes can fit most cars and small SUVs. And, each Zacar car window cover comes with Lifetime No-Question-Asked Money Back Guarantee. So now you can buy with confidence! While sun shades can be used while you’re driving, you can’t put anything on your windshield since you’re sure to experience a vision problem or two if you do. So, what do you do to protect your interior when your car parked under the hot sun? A car windshield solves this problem easily. Protect the inside of your car from the glare of the sun with a windshield cover. Also, nowadays, cars are usually filled with electronic devices like GPS, LCD screens and etc. These devices can easily spoil under the hot sun. A sunshade can be used to protect these electronic devices from overheat or cause the plastic casing to deform. There are many types of windshield shades: foldable, accordion-style, and even a retractable windshield shade. Why should you settle for a windshield shade that doesn’t fit right? This shade comes in many different sizes so you can find the one that’s right for your car. You can install it either vertically or horizontally, depending on what fits your car better. That makes this sun shade highly adaptable. This shade can also block out over 99% of the harm done by UV rays and can even reduce heat by up to 80%. Plus, it can even keep your car interior cooler and comfier. Each shade you buy also includes a non-slip dashboard mat. Talk about a bargain! 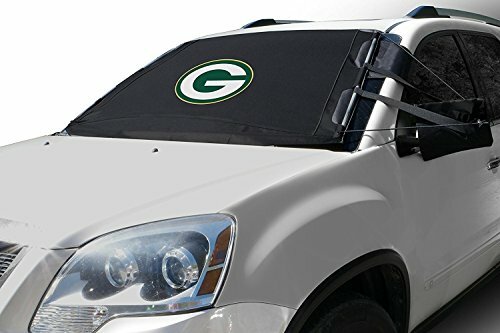 The great thing about this retractable windshield sun shade is that it is available in multiple sizes, so you don’t need to worry about its fitting. All you have to do is send your car year and model, and the company will send you the best fit. Easy as that! It is also made up of high-quality material that can effectively lessen both heat and the harm caused by the sun’s UV rays inside your car. It even has a metal structure to make it all the more durable. Plus, the application is just a one-time deal. To use, you only need to slide the shade from left to right. With this sun shade from EcoNour, you won’t ever get sweaty! 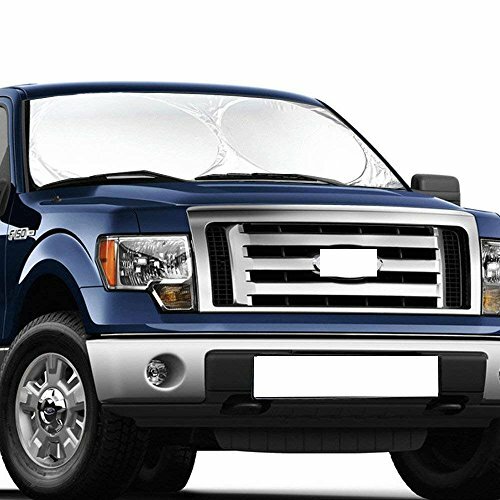 This windshield shade protects your car interior from the heat of the sun as well as its harmful UV rays. It is made from high quality and highly durable materials that allow it to keep the inside of your car cool and comfy. Even your seats will stay fantastically cool! Set up is also very easy. All you need to do is pop up this shade, and effortlessly fold it back up after each use. If you already have sun shades, why would you need window curtains? For one, these curtains offer more shade and privacy than most sunshades since the fabric used is more opaque. They can also be easier to use since they require one-time installation only. All you have to do is pull it left or right to open it once attached. 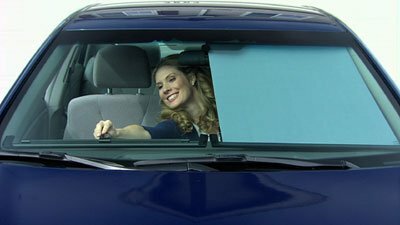 Car privacy shades also work well in keeping your car cool since some are designed with fabric that reflects the sun’s heat out. This Pony Dance car window curtain measure 27.5 inches by 20.5 inches and comes with three powerful suction cups to ensure strong suction. It also come with one extra for standby. 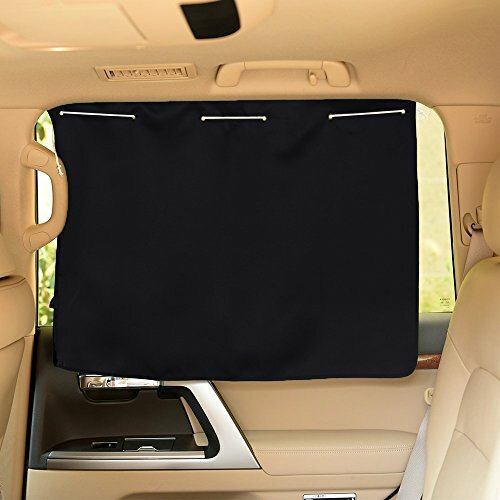 This sun shade is a curtain that can be pulled to one side when you need to see outside or pulled to cover the whole window. 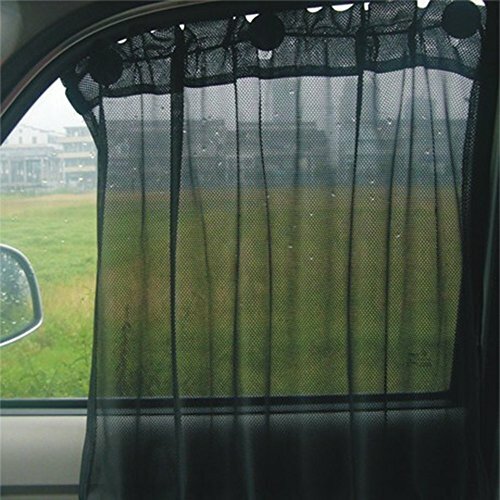 The Pony Dance car window curtain is made of heavy fabric for durability but soft enough to to make the curtain look very upmarket. Best of all, this car window curtain is washing machine safe. The heavy fabric keeps out above 85% of sunlight and helps reduce noise from outside too. The buckle and flexible rope make it easy to adjust the width of the curtain to fit your window size best. Also, your window can be partially rolled down even the sunshade is attached. There are two colors to choose; black and grey. While it’s best for you to get a full-length car cover for winter, you can also avail a windshield cover. The best windshield snow cover can protect your windshield from scratches caused by snow and ice. With one installed, you can also avoid scraping off frost build up in the early morning. While some windshield covers are thick enough to defend against hail, it might be better to rely on full-length covers for this. After all, hail causes more extensive damage than snow and ice. It’s much better to get more durable and specialized protection (especially if you live in a hail prone area). Also, if you want to learn how to protect your car from hail and snow with car covers, head on over to these articles – Hail Car Cover and Car Cover for Snow. There are many different types of sun shades and window covers in the market. Many brands also made different sizes to accommodate different vehicles. Let’s take a look at some of the most common types of window shades. This sun shade lets you deploy and fold down quickly into a pouch. It has a reinforced memory wireframe and usually comes in a rectangular size. Normally this sunshade has one suction cup attached at the middle of the shade for it to adhere to the car window. This kind of sunshade uses Static Cling Technology to adhere itself to the car window. It’s easy to remove and install. However, the downside is that the window cannot be rolled down when it is attached. 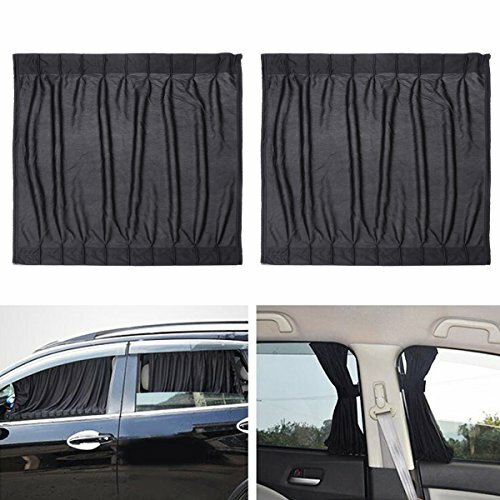 This sun shade fits over your window frame and is on the inside of your car window. It uses brackets to hold the car window covers in place. Also, you can roll down your car window even the sunshade is attached. 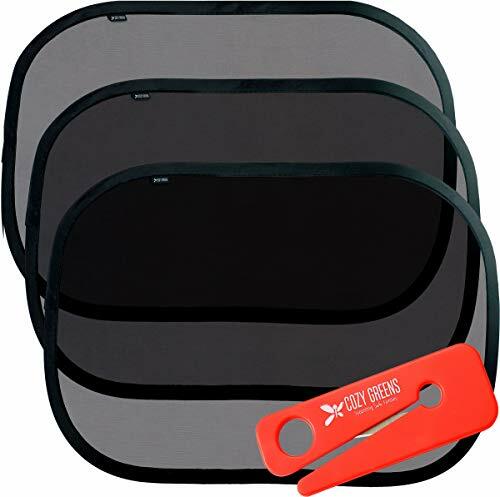 This kind of sunshade holds on to your car window using either suction cups or clips. To use it, you just need to pull the roller shade down and hook it at the pin. You will not be able to roll down the window when using this car window cover, though. When choosing a window covers for cars, you want one that will protect your passengers from harmful UVA and UVB rays, especially for babies. Find one that made of heavy fabric that is good enough to shield against the ultra-violet and sun glare. For those sunshades that need suction cups to work, make sure to pick one that has a strong and large suction cup to ensure the shade won’t fall off. Sunshade that falls off to a baby can become a choking hazard. There are many ways to stick a window sunshade to your vehicle. Some use Static Cling Technology while other uses suction cups or curtain. Each of them has its pros and cons. Choose one that fits your lifestyle the best. If you have been avoiding PVC products, then it’s better to avoid the sunshades and window covers made of Static Cling Technology. These shades use PVC as part of the ingredient and it’s this PVC that gave the sunshades clinging effect. Majority of the aftermarket car window covers are made to be portable. However, it can be a hassle to install and keep after each use. A more permanent solution is to get your car window a better tint to block out UV and sun glares. Not all car window covers or sunshades are made to perfectly fit for your car. Be aware of your car’s window shape and size when purchasing a car window shade. Measure your car window size as well as consider the window frame size before making a purchase. While a car window cover is usually made of lightweight material but it’s a good reminder that the heavier a sunshade, the harder it will adhere to your car window. Always choose one that is made of lightweight material which is easier to put up and take down. Although car window shades are installed on the side windows but whenever you need to reverse or change lane, you must be able to see the surrounding. So, a car window shade beside offers sun protection; it must also provide adequate visibility for the driver. Like most car covers, custom sun shades are also sold for you to avail. After all, we live in a world where customized things are much more accessible. You can ask for custom car window shades in an auto part shop to fix your measurements accurately. Now that’s quality service right there! If you’re looking for a durable and perfect fitting shade, a custom windshield sun shade might also be the better choice. You can even have truck sun shades, and baby sun shades custom-made for you. Either way, sun shades are highly accessible in stores like Walmart and Autozone. And, some of the best car window covers can be bought online at Amazon too. Aside from its features that block heat, a car shade cover can also offer more benefits for the average car owner. A car window cover can help to lower the temperature inside a car by as much as 40 degrees, shortening the time it takes to cool your vehicle. And, during the winter month, some specially made cover has a reversible heat-absorbent felt material that draws the warmth from the sun and raises the internal temperature. Also, depending on what you need, you can get different kinds of car shades like a rear window shade, large size sunshade made for specially for trucks, a high GSM sunshade made to block out 95% of sunlight, and many more. With the tech available today, brands are making more and more types to suit whatever you need specifically! If you want to know more about particular types of car covers and the brands that can cater to such models, head on over to these articles – SUV Car Cover, BMW Car Cover and Covercraft Car Covers.